A short zoom, with a focal range of 35-70mm, is considered as the 'standard' and is a very popular choice as a kit lens with camera manufacturers. The lens is not only available for SLR cameras but is often fitted to a compact for the same versatility it offers. 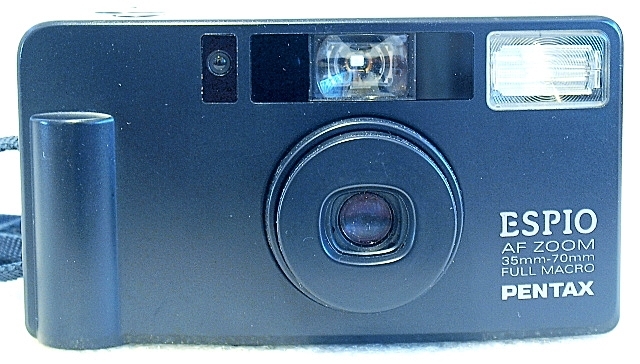 The Pentax Espio AF Zoom (also called the IQZoom 70XL), introduced in 1991, is one such camera. The camera uses a 35-70mm F4.3~8 of 8 elements in 7 groups construction with a minimum focus of 0.6 meters. Though small and compact in size, with an equally diminutive viewfinder, the Espio AF comes with a programmed electronic shutter with a speed range from 1/5 to 1/400 second and B, +1.5EV backlight compensation, a built-in zoom flash with red-eye reduction mode, and a host of interesting functionalities. Film Loading and rewind are automatic, the camera is DX-coded for film ISO range from 25-3200, the lens has a minimum focusing distance of 0.6 meters with an infinity-landscape mode, and autofocusing if by active infrared with autofocus lock. Auto power off is after 3 minutes. Besides the basics, and with the right camera mode selection, you can just as easily set the camera up for flash off or auto flash on photography, daylight synchro, backlight compensation, dual-frame or auto tele-wide self-timer modes, continuous or timed interval shooting, multiple exposures, and infinity landscape focusing. Shipped with a svelte matt black designer body with a vertical cylindrical arc handgrip and minimalist features, the Espio AF Zoom is rather excitingly modern. It is one of the successful compacts out of the Espio series from Pentax, as raved about on the Internet. 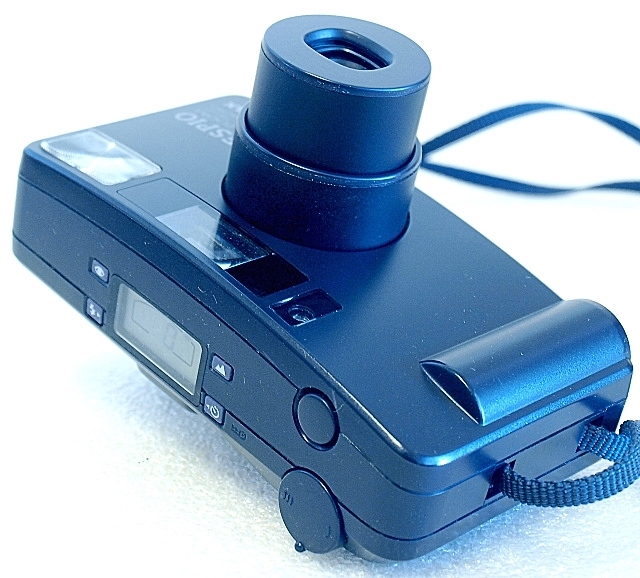 On the front, the cylindrical arc handgrip, a flush circular lens housing opening with iris blades for lens protection. 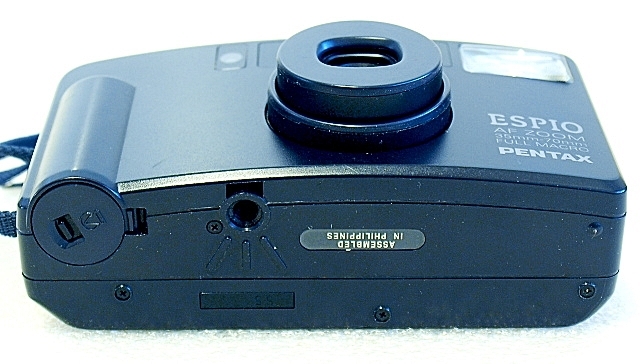 On the upper portion of the front plane, a series of cutouts and openings, from left to right, for the Light Sensor window, a pair of Autofocus windows flanking the Viewfinder window, and the built-in flash unit. On the top plane, the LCD panel with a mode selection button on each corner, the shutter release button, and the circular zoom wheel, anti-clockwise for zooming out, and the opposite for zoom in. 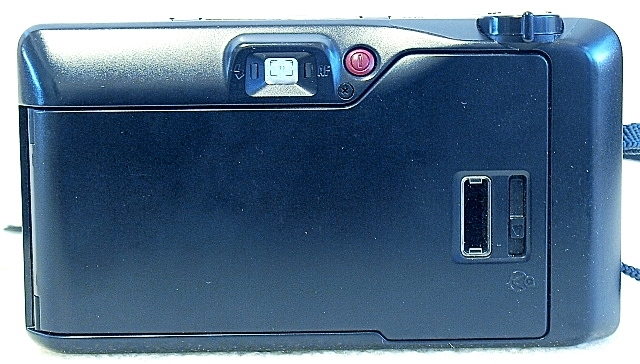 A rather plain back, with the viewfinder window flanked by a pair of LED indicators on the top portion of the backplane, and a red Power On/Off button beside it. The outer edge of jog dial for the zoom in/out function right where your thumb is, with the film id window and latch-release for opening the film box on the film back itself. On the bottom, just the tripod socket and battery chamber cover. 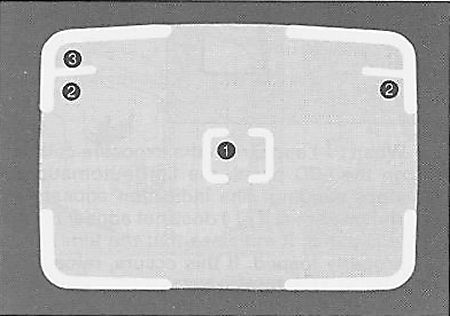 The film box is a standard quick load type with the film canister chamber on the right and film spool area on the left. Loading is simple with the film tab pulled flat across the film frame to the red mark before closing the back. The auto film forward mechanism of the camera will take over then. Film rewind is automatic at the end of the roll. Mid-roll rewind is activated by turning the camera On, pressing the Self-Timer/Mid-Roll Rewind button and holding down the shutter release for about 3 seconds. The black dot within the LCD panel will blink for this procedure. 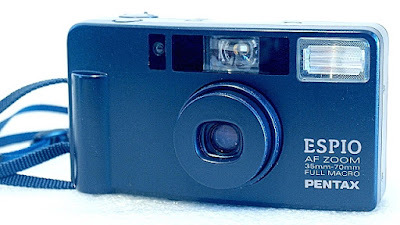 The viewfinder is an actual image viewfinder with 83% field of view, zoom enabled with marks for AF point (1), parallax compensation line (2), and picture frame (3). The Green LCD display on the right of the viewfinder will light up when the subject is in focus and will blink when the subject distance is shorter than 0.6 meters. The Red LCD is the flash ready indicator. The LCD panel is a bevy of icons displaying all the functions and settings the camera is set up for. It does not display all the settings in its entirety, just those that are pertinent to the current shooting mode. 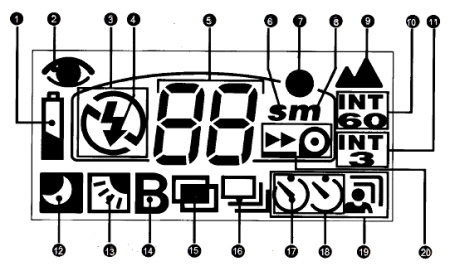 The display includes icons for Battery Exhaustion Warning (1), Red-Eye Reduction Flash mode (2), Flash ON (3), Flash OFF (4), Film Counter/Interval Counter (5), Second (6), Shutter Release button (7), Minute (8), Infinity Landscape mode (9), 60-Minutes Interval Shooting mode (10), 3-Minutes Interval Shooting mode (11), Slow Shutter Speed (12), Backlight Compensation mode (13), Bulb mode (14), Multiple-Exposure Shooting mode (15), Consecutive Shooting mode (16), Self-Timer mode (17), Dual-Frame Self-Timer mode (18), Auto Tele-Wide Self-Timer mode (19), and Film Rewinding (20). Red-Eye Reduction Flash (Top Left Button) - In this mode the flash will discharge twice, to reduce the red-eye effect. 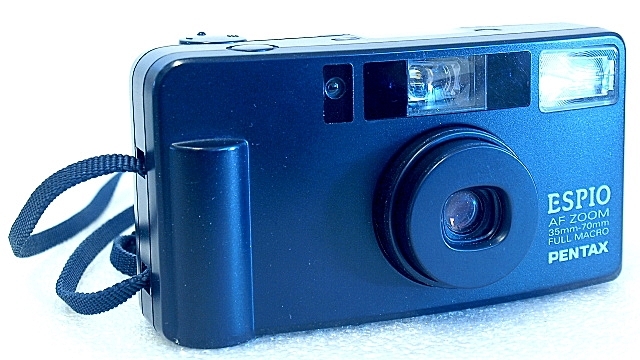 Infinity Focus (Top Right Button) - Sets autofocus to infinity with Flash OFF. 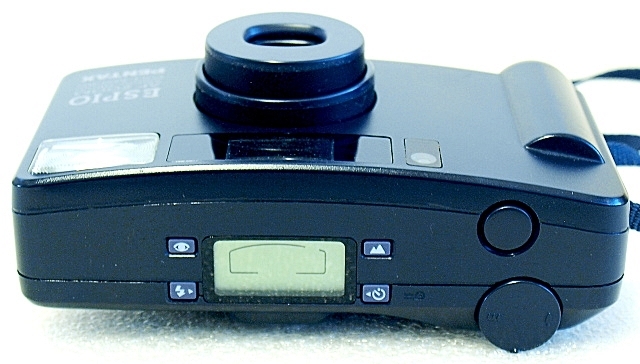 Shooting Mode (Lower Left button) - Cyclic selection for Auto, Daylight Sync, Slow-Shutter Speed (Flash OFF), Slow-Speed Sync, Backlight Compensation, Bulb, and Bulb Sync. Self-Timer Mode (Lower Right Button - Cyclic selection for Self-Timer, Dual-Frame Self-Timer, Auto Tele-Wide Self-Timer. If you find this hard to follow, the best is to download the Instruction Manual from here. 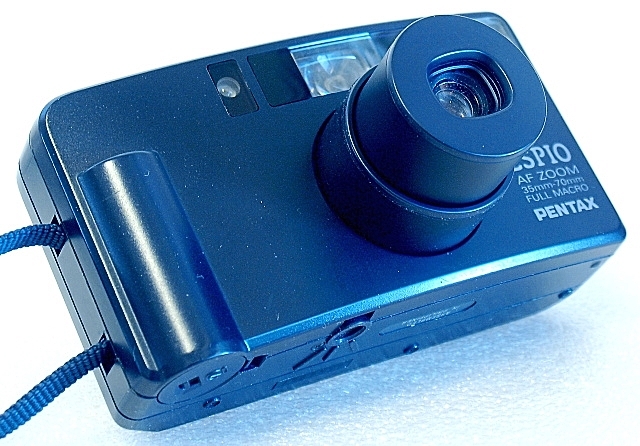 The Pentax Espio AF Zoom requires a single CR123A Lithium pack to operate. The battery should last in excess of 10 rolls of 36 exposure rolls of film with limited flash usage. The Pentax Espio AF Zoom is easy enough to operate, to a point where it is really a point-and-shoot camera. The camera body is compact and small enough (weighs 240 grams without battery) to fit into an oversized pocket or purse, albeit the diminutive viewfinder and the whirr of the zoom mechanism that may be of a little distraction. The other distraction and a point to remember is to re-set the camera mode to your preferred setting once your power down or after the camera does its own auto shut-off. All the best!